Most days I find the only equipment I need is a good attitude. Especially when my raven friend messes up my hair garland! paper bag, pencil, colored pencils, white ink, glaze, and acrylic paint. Oh how perfect is this!!!! I bet you would love that in your own hair as well.....or is it you? What a beautiful bag lady again! Such a good reminder (about the good attitude!). 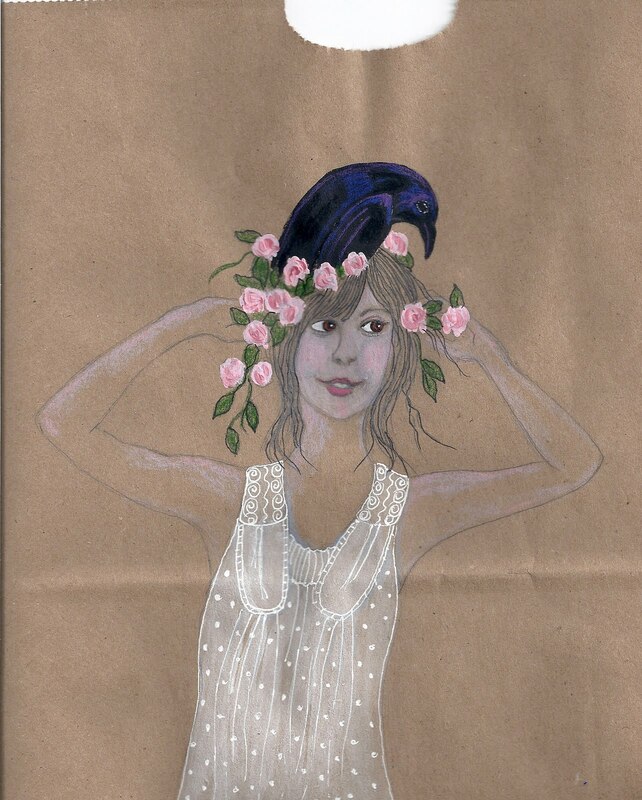 Such a lovely and whimsical illustration and I love (lovelovelove) that your canvas is a paper bag! It's gorgeous.....I want the dress and I want the Raven on my head! Happy Sunday from FOGGY San Francisco....and...it's "Bay to Breakers" Day! Wait till I do my post about art inside the de Young - and "art" outside today! Oh she looks so into summer. love the dress. if I were wearing that today I'd be shivering. happy weekend. she is absolutely fabadabadoolishus, love the colours and her expression and of course the raven. wonderful. you have all the equipment to make the most wonerful art! i blew this up and i can't believe her dress. not only is it beautifully done but you can see the outline of her body. as far as i'm concerned, you win the IF award this week. What a sassy little gal with the raven on her head. She looks quite pleased with herself. Great drawing. I hope you had a good weekend too. This is great! I love your use of paper bag! I hate when that happens! Lovely as always! This is delightful. I like. 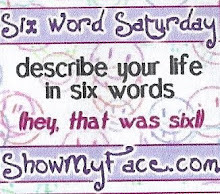 I like....and it's SO true about the attitude. I LOVE this chipper character and her wonderful hat. I always love your bag ladies. Somehow that brown background just high lights the delicateness of the dress. Such a fun picture. I just love it. 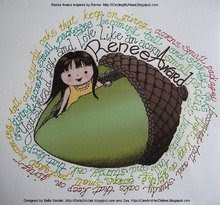 Your work is always such fun to see. I like yours too - thanks! Glad to see another delightful bag lady...She is the most dainty and girlie girl of them all...that dress...OOOOOh that dress!! !OOOOH La LA! Love her dress!!! Awesome...the sheerness of it! i LOVE your drawing,it's so beautiful! i had no idea artists did this,using paperbags for illustrating. i am not an artist, but i've been drawing on paperbags since highschool, just doodling. i recently showed one i did (and one last year) which made me really nervous to do (show). anyway, yours is so lovely really. i am really inspired. 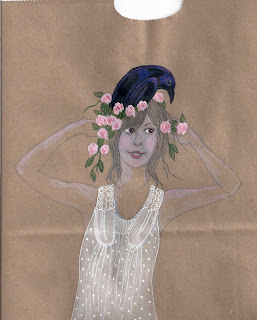 So much to love about this illo Laurel: paper bag as canvas, raven, flowers, light as air flowy dress - this is simply lovely!